did this and now dont know what do now. You could frame it and hang it on your wall. it would be quite tiny. Or blocky. Anyway, nice mock-up! It does a decent job of capturing the essence of the original. I like it. You might be trying to mimic the work of Hummer Team, but both the picture and the song are more polished than their typical stuff was. you still doing that sonic thing from years ago? *sigh* i wish i wasnt so limited. What do you mean? Limited by the Somari engine? 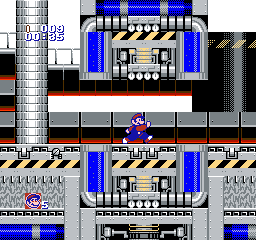 Wow, that's a really good demake of Metropolis Zone! The black void around the rings is really weird though... 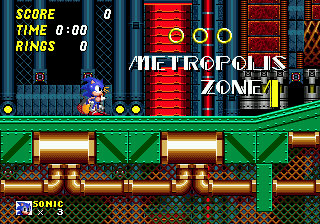 It would look much better if you reserved black areas in the background for the rings, which's what Somari did in Labyrinth Zone, if I'm not mistaken. Another thing I'm not a big fan of is the dithering on the ends of the big pipes... Alternating orange and white stripes vertically would probably look better. Not to mention that checkerboard patterns in general look like crap on the NES. 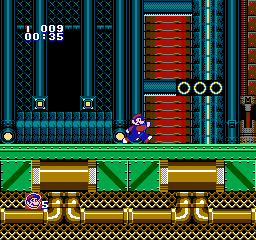 My experience with the NES is that you can use dithering to create textures, not flat colors. edit: compromised with the rings. edit2: added the screenshot of origin for comparison. Actually I meant the lines would alternate colors vertically, the lines themselves would be horizontal. I think it would go well with the shading you have above and below. This is better. If this was an original engine, that didn't inherit the flaws and limitations of Somari, the best thing to do would be to use sprites for those rings. Longer runs of rings should definitely be rendered on the background, but small runs of up to 3 rings would surely make things look more dynamic.